Unidentified American maker. Cake print depicting an allegory of Greek independence, 1823–32. Mahogany. Viewed from a distance, one’s gaze might pass right by this unprepossessing slab of carved mahogany. As one moves closer, however, the carvings resolve themselves into a detailed scene of conflict. Closer still, some elements of the carving can be made out as words: “BRITANNIA,” “AMERICA,” and “GREECE.” Upon even closer examination, one can make out the word “BYRON” carved on a tiny scroll. This is no mere decoration—this piece of craftsmanship performs the dual roles of political cartoon and culinary aid, a political statement and a kitchen implement conveniently combined into one. The carving originated sometime between 1821 and 1832, and its details allegorize a war in Europe during that period—the Greek War for Independence. The Greeks’ struggle to break free of the steadily weakening grip of the Ottoman Empire was won by the skin of their teeth and only through the aid of several of the Great Powers: Russia, Great Britain, and France. The war began in 1821 with uprisings in the Greek-majority areas of Thessaly, Boeotia, Attica, Crete, and the Peloponnese, or Morea. While the uprisings outside of the Peloponnese were swiftly crushed, that ancient home of Sparta held out, helped by its thin connection to the mainland over the Isthmus of Corinth. The revolution in Crete was quelled through the help of Muhammad Ali of Egypt, who though nominally a vassal of the Ottomans, enjoyed a high degree of autonomy. Ali was asked to send a fleet to recapture Crete in return for dominion over the island, a deal which he happily accepted. The rebellion in Crete was thus mostly quelled by 1824. The Peloponnesus, however, was another story. Although the Ottomans retained control of a few forts, the landmass was almost entirely under rebel control, and Ottoman attempts to invade were met with disaster. The Greek fleet, moreover, was the lifeline of the rebellion and kept supply lines open to keep the Peloponnese from starvation. However, by 1824 civil war had broken out in the rebel forces, and while peace was restored by 1825, the rebels were severely weakened. Later that year, Muhammad Ali was promised not only Crete and Cyprus but also Syria and the Peloponnese if he sent an invasion force, so the Ali promptly sent an expedition commanded by his son, Ibrahim Pasha. The Egyptians enjoyed several early successes, and the revolution seemed on its last legs. Meanwhile, the Great Powers had been watching the events in Greece with interest. Britain and France wanted to maintain the status quo in Europe, which meant keeping the Ottomans strong. However, Russia wanted war with the Ottomans to increase the tsar’s prestige. In addition, war over Greece would cement the tsar’s position as defender of Christian Orthodoxy. Therefore, Russian diplomats began pressing for Greek independence from the Ottomans and threatened armed intervention if said independence was not secured. Britain and France were thus obligated to take a slightly pro-Greek stance so as not to antagonize the Russians and to negotiate for far less than the tsar wanted in order to limit Russian power. In 1825 Britain, France, and Russia began negotiating with the Ottomans for peace in favor of the Greeks, and in 1827 this was formalized as the Treaty of London, under which Greece would receive limited autonomy while still paying tribute to the Ottomans. While the Greeks accepted this treaty, the Ottomans did not, and a Great Power coalition fleet was sent to the Mediterranean for further negotiations. Any talks that took place were short and sharp—after a series of misunderstandings during which both sides believed the other was the aggressor, the Ottoman-Egyptian fleet and the Great Power fleet met at the Battle of Navarino. This battle resulted in the wholesale destruction of Ottoman-Egyptian naval forces and the end of an Ottoman maritime presence in the Mediterranean. Russia promptly declared war, and France sent an expeditionary corps to Greece, which made short shrift of the suddenly unsupplied Egyptian army in the Peloponnese. By 1829 hostilities ended, and by 1832 Greece was totally independent. This carving effectively captures the war through the use of classical Greek imagery. It depicts the reclining Britannia watching a weeping Greece as a Turk threatens her with upraised sword, held back from striking by another female figure with an eagle on her shoulder. This figure represents America and is the element of political activism in this carving. In actuality, the young United States took no part in the conflict, but many within the country viewed intervention as a justified national obligation. The ancient Greek ideals of equality and democracy had served as the foundation of America, and many philhellenists, or “Greece-lovers,” used this to justify American intervention. With the addition of the fact that the Ottomans were an imperial power, the Greek revolution looked more and more to Americans like their own revolution 50 years earlier. However, the Monroe Doctrine, promulgated in 1823, forbid American involvement in European affairs, and the idea of helping Greece was politically scuppered. However, among the American people it continued to be a common theme, and many relief organizations were organized, especially in New York City. The New York Greek Relief Committee and the Greek Philhellenic Committee of New York were two such organizations, and others in Boston were also active, some raising as much as $17,000 (approximately $400,000 in today’s money). Many volunteers went to fight on the Greek side as well, the first being a New Yorker named George Jarvis. Another, a Bostonian doctor named J. P. Miller, adopted a 4-year-old orphan while acting as an army surgeon in Greece and brought him back to America. This orphan, Lucas M. Miller, grew up as an American and was elected to Congress in 1891. As rich as the historical subject matter is, this carving was not merely a household ornament. 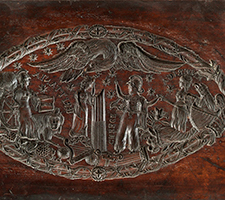 The carving is part of a European tradition that had found a home in New York City—that of cake molding. 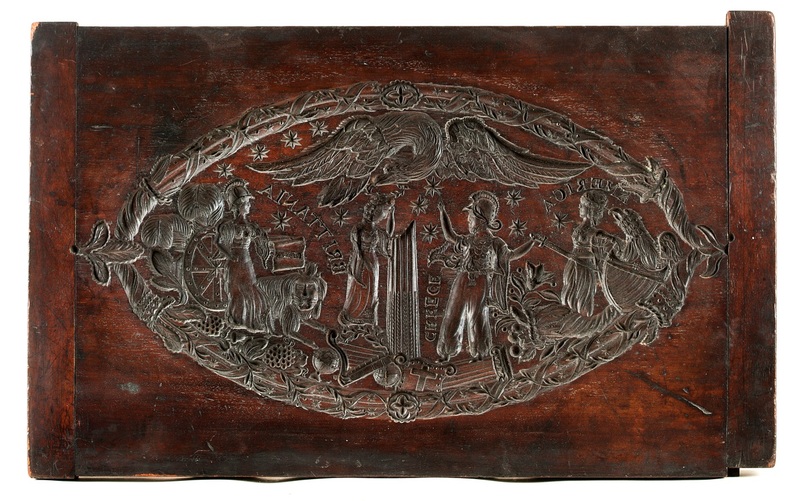 Dutch cake boards, or Koekplanken, were imported to America with early Dutch settlers, and their use became a New York custom. Frosting, while extant, was more or less limited to the privileged classes, and the common people turned to less expensive methods of cake decoration—the cake board. Dough would be chilled and then the top-pressed with a mold, imprinting a design or motif on the cake. These cakes of “stiff white dough” would be served on New Year’s Eve, and the imprints that they bore were frequently indicative of the baker’s opinions or political affiliations. The cakes from this print, with their stylized representations of countries and simplifications of the geopolitical situation into illustrations, were nothing more than edible political cartoons. Earle, Edward Mead. “American Interest in the Greek Cause, 1821-1827.” The American Historical Review 33, no. 1 (October 1927): 44-63. Hoffer, Margaret K., and Roberta J. M. Olson. Making It Modern: The Folk Art Collection of Elie and Viola Nadelman. N.p. : GILES, 2015. Schilstra, J. J. Koekplanken. Bussum: Van Dishoeck, 1974. “Special Collections.” New-York Historical Society. Accessed August 7, 2016. http://www.nyhistory.org/exhibits/collections/list. US Government. “MILLER, Lucas Miltiades.” Biographical Directory of the United States Congress. Accessed August 2, 2016. http://bioguide.congress.gov/scripts/biodisplay.pl?index=M000746. Weaver, William Woys. “Cake Boards.” Early American Life, February 2001, 30-38. Webster, Daniel. “The Revolution in Greece.” Speech presented at The House of Representatives, January 19, 1824. In The Writings and Speeches of Daniel Webster in Eighteen Volumes, 60-93. National Edition ed. Vol. 5. Boston, MA: Little, Brown and Company, 1903. Accessed August 2, 2016. https://archive.org/details/writingsspeeches05websuoft. What cake board designs would make sense today? Recent anniversaries, like the Gettysburg address.